Heat the broiler. 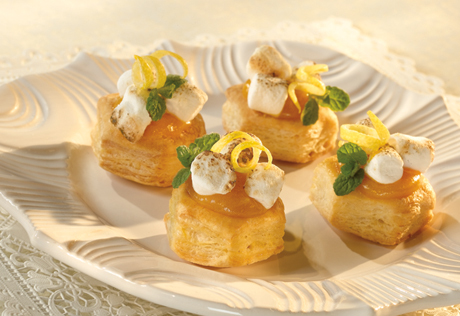 Spoon 1 teaspoon lemon curd into each pastry cup. Top each with 3 marshmallows. Place the filled pastry cups onto a baking sheet. Broil 4 inches from the heat for 2 minutes or until the marshmallows are lightly browned. Let cool on a wire rack for 15 minutes. Top with the mint and lemon zest, if desired. Easy Substitution Tip: Use 12 large marshmallows, cut in half crosswise, instead of the miniature marshmallows. Use 1 marshmallow half for each pastry cup.